2 votedIf you found this information useful, click here to vote! No registration required. If you found this information useful, click here to vote! No registration required. When thinking of a website for your business there are several costs to consider. This article aims to clearly outline these costs in a transparent way. There are various types of domain names you can get, from the common and most affordable “.com” through to more specific “.com.au”. 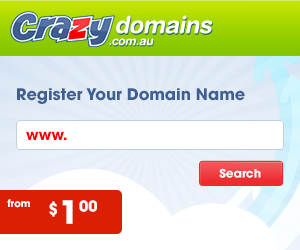 One of the domain registries I like to use is CrazyDomains who are currently offering a deal for “.com” from $1/year! CrazyDomains is an Australian business! You also need some “space” out on the Internet that stores all of the files for your website, this is called a Web Host or “Hosting”. Web Hosts can have a huge array of products to suit the size of your website, the number of visiters you may be receiving, databases, emails and a plethora of other features. For most people with small businesses the basic products are enough. CrazyDomains is $2/month. There are a lot of tools out there to help you build your website, however nothing beats someone with knowledge and skill. This is where SybaSpot really shines! We can design and develop your website to your satisfaction and upload it to your preferred Web Host, ready for the world to see! Websites start as little as $150 for not-for-profit organisations, and the average price for a website similar to this one is $500. One Response to What costs are involved in making a website?